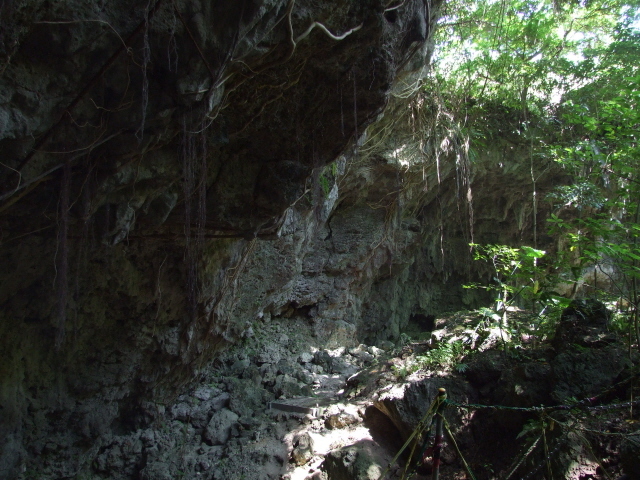 One of Okinawa's many "gama", that is: limestone caverns, which are often also interconnected by a maze of underground passageways, that cave been naturally carved out of the rock by water. 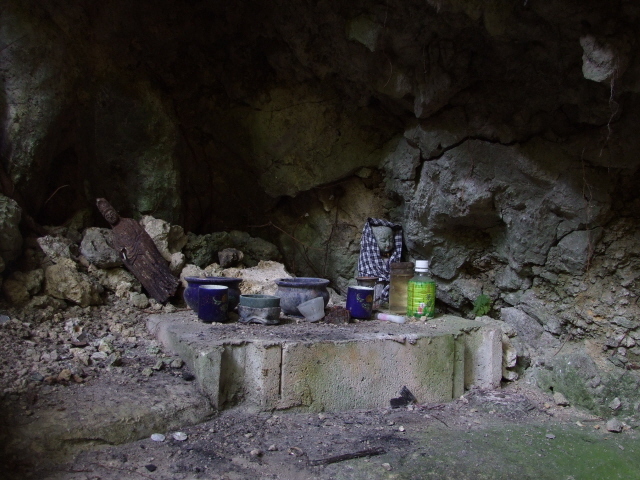 During the fierce Battle of Okinawa, towards the end of WWII, many of these caves were used by both the military and civilians to take refuge in. 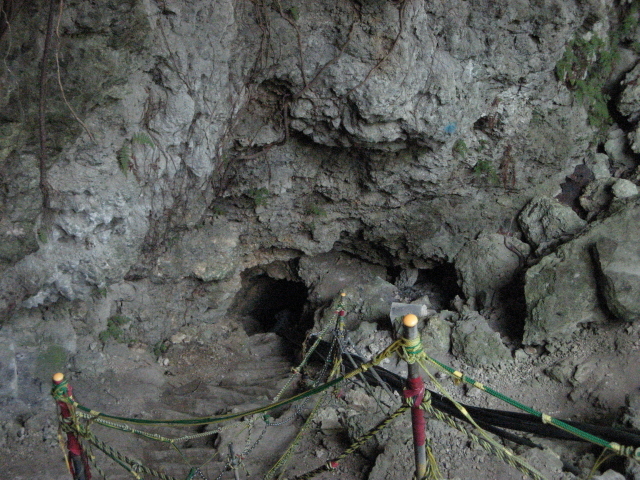 In Todoroki cave hundreds of citizens gathered, and terrible tragedies are said to have occurred here. There are stories of Japanese soldiers depriving already starving civilians of their provisions, of a crying babies strangled to death to silence it, or of US forces indiscriminately killing military and civilian people in the cave by throwing bombs into it. It's difficult to verify any of these stories, but even without the details, it's clear that it's a very dark place, well worth the effort of seeking it out when in the area ... but it takes both determinination and guiding to find it. What there is to see: not much, but there's an eerie atmosphere at the place. 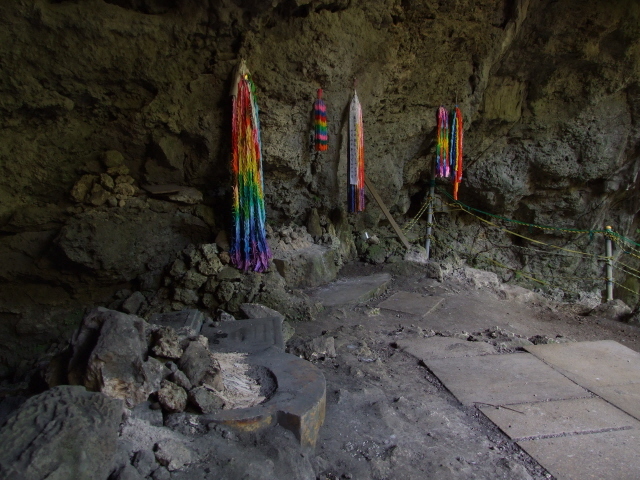 At the end of a path leading to the cave, steps descend to lower levels and past some small shrines and memorials. Some looked rather shabby and untended, others had recently deposited flowers by them, and there were strings of origami peace cranes hanging off hooks on the rock face at an intermediate level. 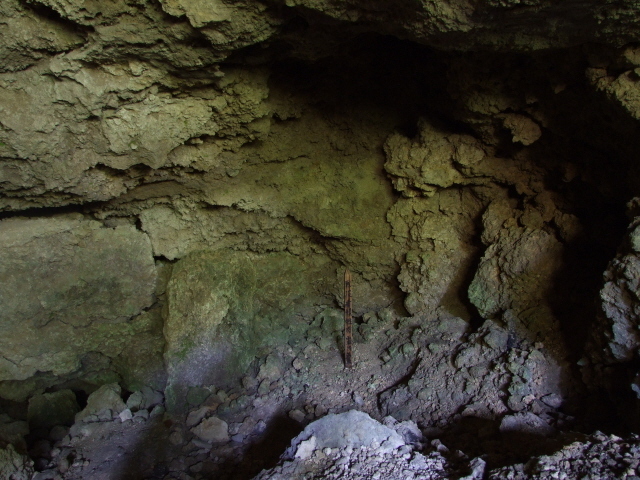 There are smaller caves at these higher levels, or rather hollows in the rock. 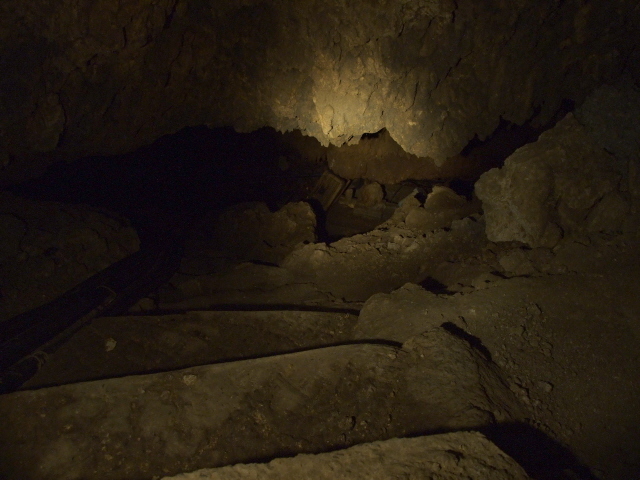 But further steps, increasingly more cracked and requiring care when descending, lead all the way to the dark mouth of a lower cave – which looks just like a bottomless hole in the ground. You can clamber in, though. Inside there are even further traces of steps, but now in a very decrepit state, so you have to be careful. It's narrow, dirty and slippery. Inside you can hear water rushing through a deeper chamber, apparently from an underground river. The small monuments, including what looks like a typical Japanese grave pole made of wood with Kanji letters on it, remain obscure to the foreign visitor who doesn't know the language, but still, with a bit of imagination, you can feel the gloomy aura the place exudes. Location: secluded in the Itoman City area of Ishiki in southern Okinawa, not far from the Himeyuri Monument & Peace Museum, off highway 331. You'll need a guide to find it! Access and costs: tricky to locate, but free. Details: you'll probably need a guide to help you find the site … as of the time of my visit in April 2009 there were no signs, and the approach path to the site was pretty obscured; even my specifically hired local guide had to ask around to find the access path to the cave. He had never been there before himself – which also testifies to the "exoticness" of the place – and clearly found it as exciting as I did when we finally got there. We parked at a narrow spot by the road, where a new road that was being built was soon to branch off the main road, walked across the building site and crossed the soon-to-be new road, past new farm buildings (with recently moved-in cows), climbed some new concrete steps and then walked along a gravel path which ended at the steps down to the caves. It looked like work was going on here too, presumably in an effort to refurbish the infrastructure, though the place was totally dead at the time – no one else was about. 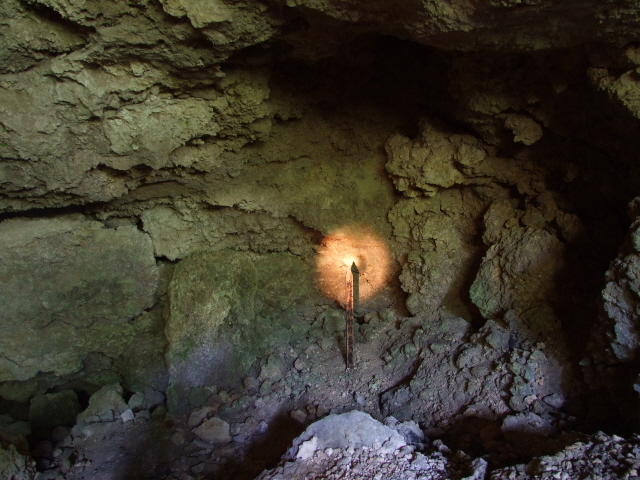 But things may change – maybe even signs directing prospective visitors to the cave will appear when the work is finished … for the time being all this remains purely speculative. Time required: depends a bit on how deep you want to descend … how much "caving" you want to dare. Just taking a look at the memorials outside, at the mouth of the caves, doesn't take long (just a few minutes), but if you want to clamber around a bit, you can spend perhaps half an hour here. Combinations with other dark destinations: a visit to the cave (if you manage to find it at all) can easily be tagged on to a visit to Himeyuri, which is closest to its location, and can also be worked into longer day itineraries, which take in the former Japanese Navy underground HQ too, and of course the massive Peace Memorial Park and its excellent museum on the southern tip of Okinawa. Combinations with non-dark destinations: see Okinawa.